The Seal Beach Detention Center (the city jail) is operating below budget, according to a Monday, Jan. 25 staff report by Police Chief Jeff Kirkpatrick. Kirkpatrick said the department had learned to operate the jail efficiently. The jail budget for the current fiscal year was $807,000. Projections indicate the operating costs will actually be $728,842 by the end of the year, he wrote. 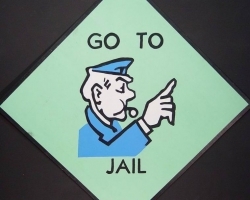 However, the jail will still end the year with a deficit of $49,639. “The center is consistently operating below budget,” Kirkpatrick said. Kirkpatrick said the jail was close to being “cost neutral,” meaning the city was close to breaking even on the operation. That was not always the case. The jail’s financial history has been troubled in recent years. “You will remember that in 2008 we had difficulty filling the cells with court authorized pay-to-stay inmates due to the center’s previous disreputable reputation,” Kirkpatrick wrote. “Today we enjoy a ‘full house’ which pays for itself,” Kirkpatrick said. The jail was closed on June 15, 2007, when the city’s contract with the private company operating the jail expired. At the time, city staff reports said the vendor had created a deficit. Staff did not know at the time that the Seal Beach jail had acquired a negative reputation in the Orange County courts. A jail guard and an inmate met in the Seal Beach jail. After the guard left the employment of the private vendor (and was no longer working in Seal Beach) , the two met again in another community and entered into a murder conspiracy. This marginal connection between the Seal Beach jail and the murder case would diminish the jail in the eyes of local judges. That wasn’t the only problem with the jail’s reputation. During the time the private vendor ran the jail, there was an escape from the jail and some guards were arrested for stealing from one of the inmates. 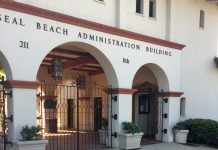 In 2008, when the Seal Beach Police Department learned of the damage done to the jail’s reputation, Kirkpatrick launched a marketing campaign to improve the situation. As part of the campaign to improve the jail’s image, Kirkpatrick moved a police corporal from the patrol bureau into the detention center to supervise daily operations. According to Kirkpatrick, the presence of a sworn police officer lent credibility to the operation. After the jail closed, the city of Seal Beach requested proposals from prospective vendors to take over the jail. All the proposals received called for the city to pay the jail’s expenses and for the private vendors to split any profits with the city. Seal Beach opted to renovate the jail instead and run the place with jail staff. While the jail was closed, officers had to book prisoners at the Orange County Jail. In a Sept. 24, 2007 report to the City Council, Kirkpatrick said the process of transporting and booking prisoners in the county jail took an average of three hours. The city paid for the time those officers spent at the county jail. Sometimes the wait was as long as five hours. “The booking process resulted in reducing the daily deployment by 25 percent to 33 percent,” Kirkpatrick wrote at the time. Deployment improved after the city re-opened the city jail. “Due to the skilled efforts of detention center staff, our police officers are able to quickly return to their field posts and resume patrol and answering calls-for-service,” Kirkpatrick wrote in his Jan. 25, 2010 report. “During the first half of 2010, we will submit to the courts requests for reimbursement of booking fee costs,” Kirkpatrick wrote. The SBPD processed 932 arrests last year. Kirkpatrick said this created potential revenue up to $262,132. The Kirkpatrick report was received and filed as a consent calendar item at the Jan. 25 City Council meeting. Council members did not comment on the report. 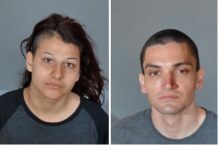 The crimes listed in the Sun Newspapers were reported to Seal Beach Police Department, Los Alamitos Police Department and Orange County Sheriff Department between Jan. 18 and Jan. 30, 2010. Only street names are used; times given are reported times, not incident times. Crime Log entries are based on preliminary information. Space limitations make it impossible to publish every incident. Until proven guilty in a court of law, all suspects are considered innocent. Counseling—8:30 a.m.—Seal Beach Boulevard—The caller said an individual was using the caller’s home number on several financial applications. However, the address the individual was using was a foreclosed property. Welfare Check—5:06 p.m.—Ocean Avenue—The caller said a kite surfer appeared to be unable to get back to shore. His kite was either gone or down. Police received several calls concerning the kite surfer. Seal Beach Lifeguards and other agencies responded. He was first reported on the south side of the Seal Beach Pier, then on the north side. At 5:20 p.m., he was out of the water and with the lifeguards. Counterfeit Bill—8:47 p.m.—Pacific Coast Highway—Two suspects reportedly gave the caller $200 in fake traveler’s checks. The suspects did not want merchandise, just cash. When the caller contacted the bank to verify the checks, they left. The suspects were described as black men in their 20s. The first suspect wore a black sweater and white pants. The second suspect wore a black hoodie. Disturbance—9:53 a.m.—Ocean Avenue—Seal Beach Lifeguards ordered a man in a Jeep to get off the beach. He did not go. The Lifeguards ordered him to to go a second time. He refused to leave. 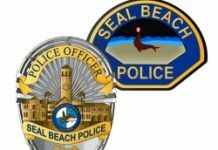 Lifeguards contacted the Seal Beach Police Department. Police unit 113 contacted the man and advised him to leave. He said he would comply. Police Information—10:24 a.m.—8th Street—The caller said he left his keys in the front door a few days earlier and now they were missing. He wanted the police to be aware of the fact that the keys were missing. He requested extra patrol checks in the neighborhood. He was counseled about security measures. Suspicious Occupied Vehicle—12:26 p.m.—Balboa Drive—The caller said there was a four-door vehicle in front of the caller’s residence, occupied by a Hispanic man. The caller did not know what the man was doing. Police determined the so-called suspect was delivering newspapers. Municipal Code Violation—8:13 a.m.—Howard Avenue—People were seen going through dumpsters. The caller said they were seen with two flatbed trucks. Police found one suspect and one truck. The suspect said he would leave the area. Disturbance Juveniles—1:05 p.m.—Oak Street—A number of juveniles were found in the flood control channel, reportedly taking ceiling tiles and smashing them. Pedestrian Check—12:25 p.m.—Katella Avenue—An individual flagged people down asking for directions. Officers found the man and assisted him. Assist Outside Agency—11:59 p.m.—Bradbury Road and Seal Beach Boulevard—Orange County Sheriff’s Department deputies assisted Los Alamitos Police Department officers looking for missing juveniles. Burglary in Progress—1:30 a.m.—Foster Road—This was a possible vehicle burglary. No one was seen and there was no break in. However, the vehicle had been tampered with. Suspicious Person or Circumstances—8:20 p.m.—Wembley Road—This was a patrol check for juveniles who were smoking. Citizen Assist—2 p.m.—Kensington Road—Children were misusing Facebook. Their parents were given guidance. Suspicious Person or Circumstances—Midnight—Pacific Coast Highway—This turned out to be a medical aid call. There was no crime. Suspicious Person or Circumstances—12:41 a.m.—5th Street—This was a patrol check for juveniles who were reportedly drinking. Grand Theft Report—11:18 a.m.—Pacific Coast Highway— This was a theft from a business. Brian Smith of the News-Enterprise contributed to this article.